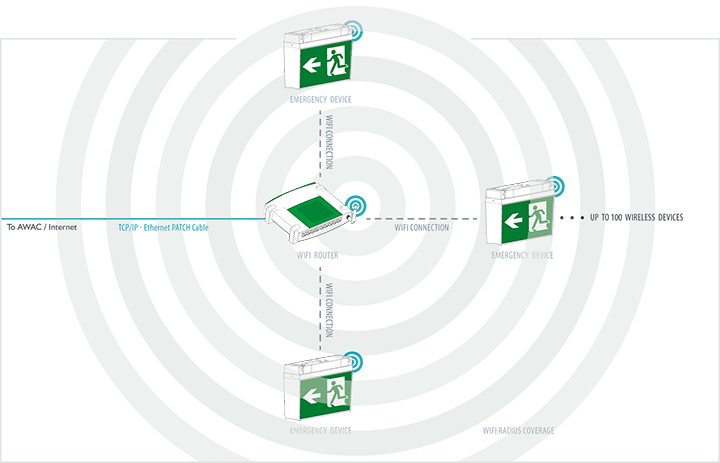 The typical setup for a small office is a single router connected to a number of nearby wireless emergency devices. The maximum range of a wireless router is determined by the building’s structure. Emergency Wi-Fi device can work on any 2.4GHz Wi-Fi network, users are free to supply their own network. For ease of commissioning, it is recommended to use one subnet per AWAC. It’s possible to increase range by adding another AP repeater (Access Point repeater) or by adding another Wi-Fi router. Repeaters are devices that are specifically designed to extend the range of a network by picking up a signal and passing it on to the next device. 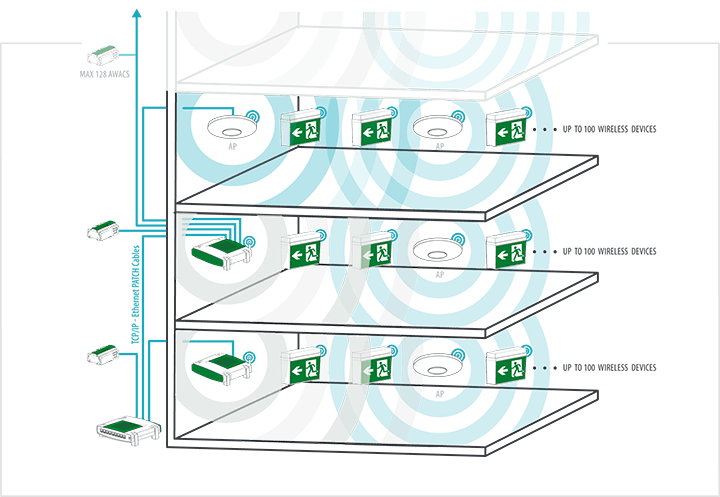 There can only be one wireless AP hop in the network, up to 128 AWACs and up to 100 wireless emergency devices per router. In theory, the AP’s Wi-Fi coverage is spherical and so the distance an AP can reach should not only be measured horizontally. 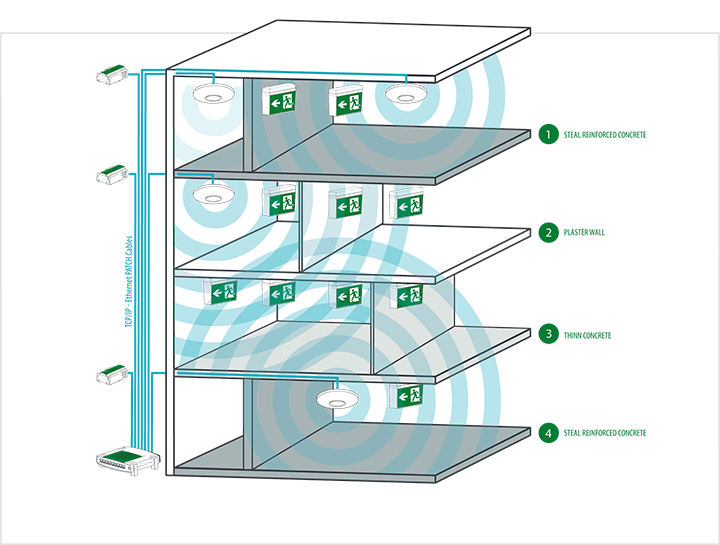 Depending on the wall/ceiling/floor surface thickness, an AP’s Wi-Fi coverage can reach between floors and rooms. Taking this into consideration can affect how many AP’s are really necessary and help reduce the amount. The Wi-Fi signal from the AP to the left can not penetrate the steel reinforced concrete wall, another AP must be added to reach the emergency devices. The Wi-Fi signal can easily penetrate the plaster wall reaching all three emergency devices. There is no need for an AP on this floor as the AP Wi-Fi from the upper and lower floors reach the emergency devices below and penetrates the thin concrete wall. Itâ€™s also possible to use a wired router and wire through thick steel reinforced concrete walls to an AP whose signal can reach the emergency devices.